Found this rare edition today which I've never seen before, but have heard about. MEDIA are known for debuting Carpenter's Halloween on home video in 1979 under their original "MEDA" name. MEDIA subsequently re-released the film on VHS and Beta in 1982 (see the Beta here) while keeping the box in-print for several years. All of these were the theatrical cut. 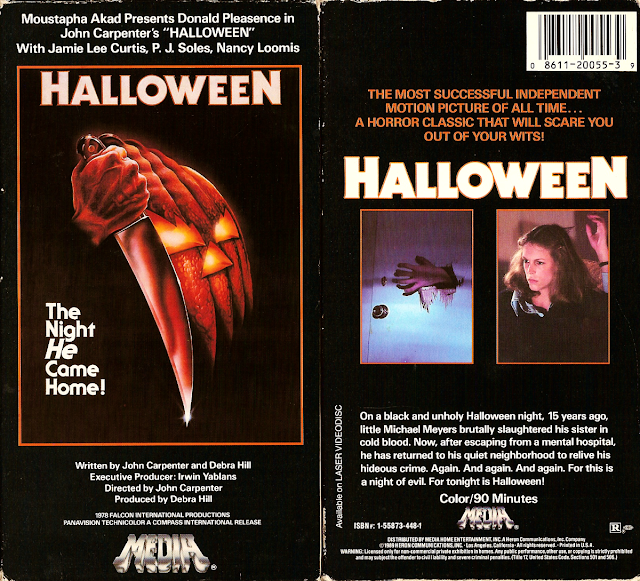 Some copies of this 1989 tape, the distributor's final Halloween release, were the unadvertised and first ever presentation of the television version on home video. This tape is confirmed to be the TV edit from the cassette's date and by actually watching it. Here's some more info on this tape found here: 1987 Media Home Entertainment Version - In 1989 there was an accidentally released TV version. This version was also released by Video Treasures in 1990, just after Media went out of business. The box covers for the 1987 and 1989 Media version and the VERY rare 1990 Video Treasures TV version are very similar. They are basically the same on the front. But, on the the back, the Video treasures box has the Video Treasures symbol on the back, the Media version does not. This version is out of print and is like trying to find a needle in a haystack to find. It has been discovered that not all of the 1989 Media releases actually are the TV version. Confirmed with several e-mails, it has been determined that the regular version was released in 1989, but it wasn't until August of 1989 that the TV version was released. The only way to verify that a 1989 version of the Media release is the TV cut is to check the date stamped on the front end to see when the tape was duplicated. interesting historical piece you've got in your hands there for sure. must admit tho i do like the anchor bay divimax 25th anniversary edition H25 release. it's pretty sweet for what it is. Damn, I wish I had read this before. I bought this tape in an eBay lot, assuming that if it had the same cover then it had to be the TV version. It turns out that my Media copy is from 1990 and it's the theatrical version. So they must have realized their mistake and reissued the correct version immediately after issuing the TV cut. Oh, well.